This vegan couscous salad (or couscous pilaf) is a healthy meal in one dish. Thanks to a few shortcuts, it also takes just minutes to prepare, making it ideal for busy weeknights. The recipe includes fresh vegetables, including corn, tomatoes, and green pepper. For flavor, use your favorite salsa and canned beans are used for a simple and tasty protein. This colorful, nutritious dish really is a complete lunch or dinner on its own. You'll also be happy to know that the recipe is low-fat and has very few calories. Not only that, all the ingredients are affordable. Prepare couscous according to package directions using 1/2 tablespoon vegetable oil. Allow it to cool. Transfer couscous to mixing bowl. If you need this recipe to be gluten-free, you can swap out the couscous for quinoa. This works out well, especially if you happen to have a bunch of leftover quinoa on hand. While this recipe has a nice, spicy kick because of the salsa, you might want to try something a little different for another meal. 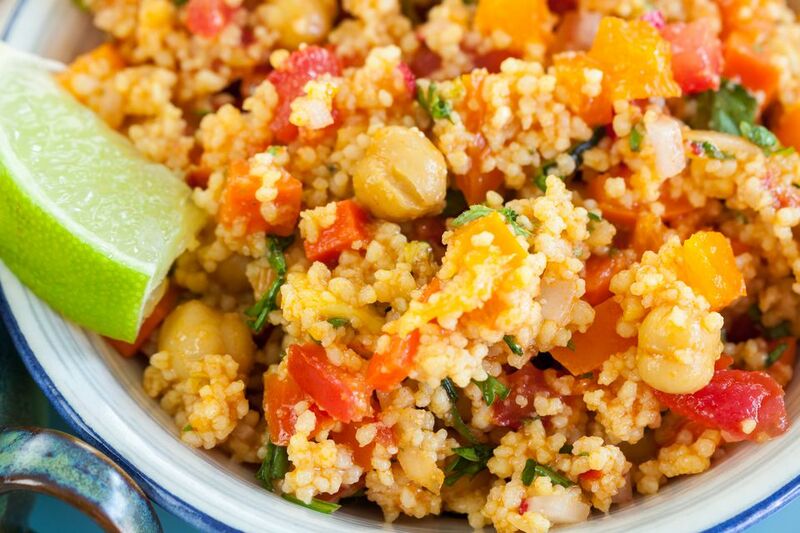 Try making a couscous salad with chickpeas. You'll need cucumber, green onions, Dijon mustard, and lemon zest, along with a can of chickpeas (or garbanzo beans, if you prefer). You can make a couscous salad with tomatoes, garlic, and coriander. A vegan Israeli salad with pearl couscous is a fresh salad featuring the tiny version of couscous known as Israeli or pearl couscous. It's simple to make as well. It's a bit more rice-like and mixes perfectly with fresh veggies. Ready for a really fun idea? Take that couscous salad and stuff it inside whole bell peppers. Green, red, or yellow...choose whichever peppers you like and enjoy this colorful and healthy dish.